A short drive from Berlin, Wittenberg is the cradle of the Protestant Reformation. This small town’s peaceful atmosphere, with its beautifully restored historic quarter, stands in spectacular contrast to the impact of the movement which started here 500 years ago. 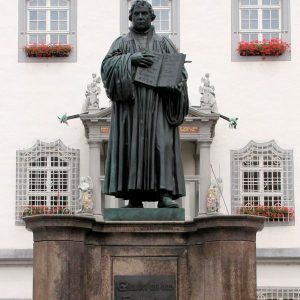 On October 31, 1517, Martin Luther, then a little-known Augustinian monk, priest and professor of Bible Studies, published his 95 theses on the doors of the Wittenberg Castle Church. Mere decades after the invention of the printing press, Luther became one of the first ‘media stars’ of the modern age. What began as a theological debate within the Catholic Church would lead to one of the most influential transformations in modern world history. It triggered not only disagreements within the Christian Church but also sent shock waves through the political, cultural and social fabric at the time, eventually resonating far beyond the borders of German lands and with the effects of Luther’s actions and ideas still felt in our world today. In Wittenberg, Luther’s residence for most of his adult life, you will meet many of the lesser known characters with whom the reformer shared his life, his thoughts and who helped pave the way for his and the Reformation’s success. The most intriguing character however remains the portly, rebellious, and famously foul-mouthed reformer himself. On a Wittenberg tour you will come to understand his time, so different from ours, the effect it had on his ideas, and you will see the places where he lived, where he preached, and his final resting place – leaving behind a world restless in discussing his thoughts and ideas. Melanchthon House – A beautiful Renaissance building, home to Luther’s most important collaborator, brilliant linguist, educator and theologian Philipp Melanchthon. Market Square and City Hall – The city’s main square, in front of the stunning Renaissance town hall, features the most known and iconic sculptures of both reformers, Luther and Melanchthon. City Church – The church in which Martin Luther not only gave thousands of sermons but also the first church in which the more concrete ideas of how to reform the church service were applied. Furthermore, home to a masterpiece of Reformation art: the Altar by Lucas Cranach the Elder and Younger. The Castle Church – What used to be the Wittenberg University’s chapel and auditorium. Luther’s theses were nailed to its door. Decades later, he was buried inside the church. Partly ruined during campaigns in the 18th and then early 19th century, it was remodeled in a Neogothic manner in the late 19th century. It has since been magnificently restored.